Tarpon fishing Key West is a big reason why people come all over the world to this island destination in Florida. 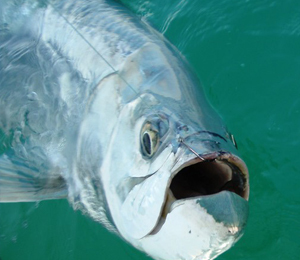 The tarpon is known as the Silver King and is very aerial and a challenge to keep hooked. The Megalops Atlanticus is found throughout the Florida Keys with Key West fishing being the hotspot. They are primarily inshore fish. The adults spawn offshore where the larval stage of the fish can be found. The Tarpon's range is from Virginia, the entire Gulf of Mexico to Brazil. Most fish range from 40-80 pounds. The smaller fish are available in the cooler months as the fish have a big migration push through the Keys in Early Spring. The ideal water temperatures must be at least 75 degrees. The tarpon is a primitive fish more than 300 million year ancestry. The Tarpon is the sought after game fish. It has unbelievable power, jumps and an attitude that will challenge the most experienced angler. They explode out of the water with fury when hooked, they are shaking and crash back into the water. The adrenaline rush is unexplainable and is a definite experience you will not forget as this is what attracts anglers from all over to the World. Tarpon Fishing Key West is done April through early July when they are most available. 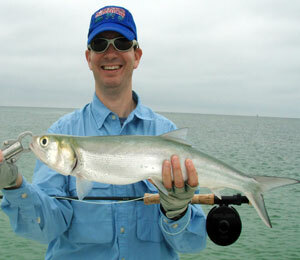 May & June are the hottest months, and are unproductive for fishing Key West for Tarpon. The Tarpon are caught year round as we have residential fish that are available during the winter months. Baby Tarpon are usually hugging close to mangroves as they are top on the sharks menu. The fish are available in the channels, edges of flats, and bridges. 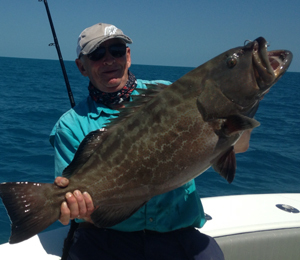 The entire chain of the Florida Keys offer textbook fishing for these armor giants which will excite any angler. Tarpon fishing Key West is commonly a sight fishing sport. The guide begins poling across a flat, usually edges, or staked out near a known Tarpon route. This is extreme sight fishing and we do not cast until the quarry is spotted. The channels are highways and places to rest and usually have a concentration of fish. Live bait or lures will entice them, the secret is to stay up current of the fish and be quiet, as these fish get a lot of play, and are smart. If the fish know something is up they will not eat, but still hang around. The fish respond well to live bait; mullet, pinfish and pilchards are the best. Lures and plugs are also great in the early morning and before and after sunset. The best rod to use when tarpon fishing Key West is a fly rod. Fly rods range from 10 wt. to12wt. The size of fish, wind conditions and type of fly will dictate which fly rod to use. Spinning rods in the 20-30 pound class along with a stout spinning reel that will hold at least 200 yards of 20 pound test line are ideal. The braided line is optimum for these fish because of its strength and durability, and has little stretch.